A Zombie in GTA IV. The Zombie is a Harley-Davidson styled motorbike featured in GTA IV, made by Steel Horse and a variant of the Zombie is made by Liberty Chop Shop. Manufactured by Steel Horse and Liberty Chop Shop, the Zombie resembles a custom Harley-Davidson motorcycle with a rigid body frame, as evidenced by the lack of a separate rear suspension module. The engine is a chain-driven, two-cylinder V-Twin internal combustion engine with a manual transmission, as evidenced by the foot-actuated gear shifter. The Zombie has elongated "ape hanger" type handlebars, which make cornering difficult with the increased sweep caused by the handle arms. Zombies are available with a fair share of differing visual components, including three different gas tank designs (one of which comes with a rear fender-mounted license plate) and three carburetor and exhaust pipe configurations. All Zombies come with custom pin striping paintwork, as well as the Liberty Chop Shop's jolly roger on either the gas tank or the carburetor. The Zombie is a favorite of The Lost Brotherhood biker gang. The Lost's Zombie is distinguishable by its "redwall" tires (compared to the conventional variant's whitewall tires), black rims, and black panelings and frame. The bike otherwise shares the same set of accessories as regular Zombies. The Lost Zombies can be found in Acter, near Gracie Ancelotti's house, but are quite rare. A customized "Lost" Zombie in GTA IV. The customized gas tank of the "Lost" Zombie, GTA IV. While able to reach a decent top speed, the Zombie's handling suffers due to the oversized front tire, and the bike is susceptible to oversteer. It can only do wheelies from high revs, and by transferring weight to the back before taking off. The Zombie has mostly good handling. Its speed and braking are superior to most motorcycles in GTA IV, compensating for its flaws. The default radio station in the Zombie is Liberty Rock Radio 97.8. In the GTA IV mission "No Way on the Subway", and in The Lost and Damned, Jim Fitzgerald is depicted riding a Zombie B. 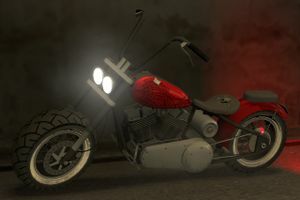 The Zombie and Hellfury are most notably the only "gang bikes" the player can ride in GTA IV. The Zombie B's paintjob can be sprayed on any Zombie in The Lost and Damned. Usually spawns all over Middle Park. Spawns when driving mostly any motorcycle. Found near Acter, driven by The Lost. * = The Lost and Damned only. ** = The Ballad of Gay Tony only. *** = TLAD and TBOGT only. **** = Different versions between GTA IV and TBOGT. This page was last modified on 24 April 2013, at 16:45.